Message On Hold Messages and Voice Overs for Phone Answering Services and Voice Message Broadcasting Services - Database Systems Corp. voiceovers and voiceover messages. When you finally contact that important prospect, you get one opportunity to make a good first impression. You must introduce your organization and deliver your message in a clear and professional manner. Your marketing campaigns are finally reaching the right audience. When you get that initial call, the first voice your prospective client probably hears is your automated phone system. This is that critical moment when you need to put your best foot forward! Let us help by offering a professional voice recording of your important phone greetings, marketing messages, on hold messaging, and special announcements. 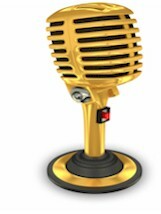 For a further information, visit our Voiceovers and VoiceOver Talent web page. Advance Primary Care specializes in family practice and house calls. Recordings for an in-office phone system to route calls from doctors, hospitals and patients. Since 1989, Concurrency, Inc. has been providing technology and integration services to Milwaukee area businesses. Recordings for a voice mail system for each department. The Cyberitas team has been developing and hosting large-scale Internet sites for 10 years - longer than all but a few of today's eCommerce companies. The specialties of Cyberitas include designing, developing and hosting large-scale dynamic Web sites and related eCommerce applications. Cyberitas currently utilizes Interactive Voice Response to assist realtors in digitally recording an audio virtual tour. Once recorded, the file is immediately sent to a website, where potential buyers can listen to the information. E-ZPass allows customers to move through toll plazas without opening a window and without the hassle of handling money or toll tickets. Recordings for a complex IVR to check account balance, replenish account, check violations and get directions to service centers. IDC provides education and training on OSHA Compliance through the development of training software to reduce the risk of on-site accidents. Voice mail system and automated fax removal system. KB Home has specialized in building homes designed for entry-level and first-time trade-up home buyers. KB Home is utilizing our voice broadcasting with professionally recorded voice over prompts for marketing and sales activities updating prospects regarding new sub-division information. Morrell of Woodbury creates parties that are remembered. Recording of voice mail system and several sets of directions to their location. New England Builders and Contractors, Inc.
New England Builders and Contractors, Inc. produced recordings for day-time and off-hours mailbox system. The State of New Jerseys Motor Vehicle Commission registration program requires much more stringent proof of identification when registering vehicles and licenses. New Jersey has published an 800 number for residents to call to obtain the current identification requirements at MVC. The state uses our Interactive Voice Response IVR services and facility to answer resident calls, providing touchphone responses to obtain the requested information. All voice prompts were professionally recorded by our voice over talent, with each prompt provided in both English and Spanish. Office Environments is an office furniture dealership, committed to total customer satisfaction. Recordings for a simple office phone system and a full music-on-hold production were provided by our professional voice over talent. Spancomm, Inc. utilized our voice recording talent for registration of a numbers set for a simple IVR system. TCC Teleplex uses our voiceover service to create professionally recorded holiday greeting messages for its clients. Techniquex is one of the largest independent floor coating contractors in the United States and is the largest TennanT authorized contractor in the world. While on hold, professional voice recordings provide techniquex�s customers informational messages regarding the company�s products and services. Universal Digital Productions - Universal Digital Productions is located in downtown Nashville, TN. For nearly a decade, Unidig has produced custom audio files for the telephony industry. Unidig hand selects their voice talents, most of whom have major-market experience and in addition to straight-up voice-overs, Unidig's pool of voice actors include those who specialize in celebrity impersonations, humor, and unusual accents. Unidig also has a team of highly educated, highly experienced and comparatively inexpensive translators who can translate and record any script into even the most obscure of languages. Unidig is so confident in their services, that they offer a money-back garuntee if you're job isn't delivered on time and to your exact specifications. Call today to check out their specials or visit their website at: www.unidig.com.